Have you seen Google’s position -1? Well, if featured snippets are position 0 then surely a snippet in the search query is position -1! This is a new feature that I have only spotted today. I hadn’t seen any announcement of this. 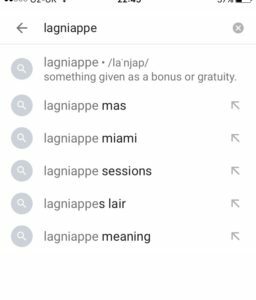 In fact, I was under the impression that Google was planning to drop search suggestions altogether – it appears that this is not true. At the moment it only appears to be on mobile. I’ve not seen this before but check it out with a number of searches yourself. 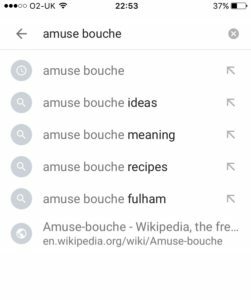 This one just gives the definition but a search for ‘amuse bouche’ gives the source. In this case Wikipedia! It’s not the top suggestion either, sitting down at position 6 but of course, it’s the most relevant. I’ve done little research so far. I just wanted to bring it to your attention and the fact that it is one position even higher than featured snippets. It also presents a rare opportunity to get your site in front of users before they have a chance of seeing anyone else’s. Google is full of surprises but this is one no one expected. It opens up all kinds of opportunities for SEO. Imagine holding this spot, not just from a list of web sites below you but from just a list of search terms where your site is the only one that has its URL listed!